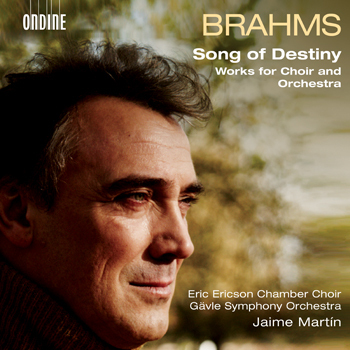 The series of Brahms recordings on Ondine with the Gävle Symphony Orchestra and their chief conductor Jaime Martín follow up with this recording of works for choir and orchestra together with the prestigious Eric Ericson Chamber Choir. Brahms’ impressive Schicksalslied was written in 1868. The work delves musically into the duality between the “fate-free,” ideal heavenly life and the existence of “suffering man” on earth articulated in Friedrich Hölderlin’s poem. During the summer of 1881 Brahms composed his Nänie on a poem by Friedrich von Schiller as a song of lament and mourning for the fleetingness of beauty. Brahms dedicated this work to Henriette Feuerbach, the mother of painter Anselm Feuerbach, Brahms’s highly admired friend, who had died in Venice in 1880. Gesang der Parzen was premiered the following year conducted by the composer in Basel on 10 December 1882. The theme of destiny is an obvious parallel that can be drawn between this work and the Schicksalslied. Written for choir and wind instruments, Begräbnisgesang is an early work of funeral music. The final version of the work was completed in 1859. Brahms wrote his hugely successful Liebeslieder Waltzes Op. 52 & 65 during 1869–74. This album includes a selection adapted by the composer. Eric Ericson’s Chamber Choir was founded in 1945 by then 27-year-old Eric Ericson, and has since taken a central position in the Swedish and international music scene. On the world stage, Eric Ericson’s Chamber Choir is among the very foremost professional ensembles, and through the years it has been awarded many distinctions. Highlights of the international work include collaborations with the Swedish Radio Choir and the Berlin Philharmonic Orchestra, with conductors such as Claudio Abbado, James Levine and Riccardo Muti, as well as the many recordings and concerts with Nicolas Harnoncourt and the Concentus Musicus Wien. Gävle Symphony Orchestra, founded in Sweden in 1912, has a long and exciting history. Since 2013, the orchestra has enjoyed a fruitful musical partnership with principal conductor Jaime Martín, but the orchestra has also collaborated regularly with renowned international conductors. The orchestra has also started a collaboration with the Eric Ericson Chamber Choir leading to a recording of Johannes Brahms’ Cantatas for choir and orchestra to be released by Ondine.